as the world changes based on obvious technological advances involving computing, the internet, and digital production, there are now new choices for those students and families who choose not to adhere to the beaten path. production. This is a good thing. Two schools, one in the United States, and one in the United Kingdom, exemplify this forward motion into the future of post-secondary education by emphasizing education based on media production, and de-emphasizing traditional courses in Western philosophy, for example, Shakespeare. The two schools covered below offer real degrees or certificates and more importantly, practical career benefits upon graduation. They differ somewhat in their approaches, degrees, and course selection, but are similar in their intent: to provide pragmatic post-secondary education to talented and creative young adults who are intent on pursuing creative passions while earning real incomes after graduation. The two schools covered below are Full Sail University in the United States and the Point Blank School in the United Kingdom and this article simply intends to lay out the presentations and claims of both for any student seeking a higher education in sound and media production. The contrast between the two is rather striking. However, both are sound, no pun intended. Simply put, for readers heading toward a career in sound, music, and media, both schools are worthwhile, high quality, and have a track record of success among their alumni. Full Sail University is located in Winter Park, Florida in the United States and bolsters an interesting and vibrant history. The inception of the school began in 1979, as a recording workshop called “Full Sail Recording Workshop” in Dayton, OH, by a Mr. John Phelps. Throughout the years, driven by student interest and teaching success, the school now commands a 192 acre campus with 49 degree programs and 2 graduate certificates which include nearly every form of digital media production avenue available to future digital media content providers. They provide degrees in music and recording (including studies in sound recording and design), games, art and design, technology, media and communications, art and design, and media and sports business. There is credence to their degrees. They are licensed by the Commission for Independent Education (Florida Department of Education) to offer Associates through Masters degrees. They are also accredited by the Accrediting Commission of Career Schools and Colleges (ACCSC), an organization that is recognized as a national accrediting school by the U.S. Department of Education. Meaning, and this is very important for students who desire a valid BA, Full Sail provides degrees that will be recognized by other schools in the United States if a student may want to achieve a Masters Degree in Sound Design or other media discipline at another university or college in the United States. In addition, their Bachelor programs are efficient and can be completed in 20 to 29 months. Programs begin monthly and therefore there is no need to wait through semesters of time to begin studying. Many of us perhaps remember slogging through low paying jobs during summers waiting for school to begin. This waste of time does not happen at Full Sail. Graduation for the hard working student can come in half the time of a traditional 4-year college. This will give any graduate an edge in entering the workplace at younger age than their peers, ready and prepared for their career possibilities of the future. In addition to their massive array of course offerings in multiple media disciplines, Full Sail functions as a proper university, providing financial aid and housing options near the campus. Upon graduation, they provide assistance for career development and work on job placement. They use a unique combination of technology such as networking with classmates and easy access to instructors online, continuous technical support, video conferencing, the ability to create via laptops from anywhere at anytime, and the use of cutting-edge media creation software to teach multi-media production. They couple this effective use of technology with the traditional model and rigors of a 4-year bachelors, requiring many hours of study and a wide array of courses needed to earn a degree. In all, Full Sail appears to provide a solid education in a wide array of media disciplines and the school and staff work diligently to aid their students in careers after graduation. One quick glance at their Alumni page attests to the success of their graduates, who work in film and sound capacities with the top media production firms throughout the world. This school is a valid option for students passionate and interested in media production. The second school mentioned in this post, is the Point Blank School, an Electronic Music School that teaches music production and performance skills and techniques in London, England, Los Angeles, US, Ibiza, Spain, and online. At the onset here, one must agree that it would be hard for anyone interested in music production not to salivate at the possibility of attending a campus to study electronic music on the island of Ibiza. This would be a young DJ’s heaven. On the island of Ibiza, specifically, it appears that students study by day and then at night are given the opportunity to rub elbows with highly successful DJ’s and are afforded the opportunity to perform at internationally renowned nightclubs on the island. This sounds like a win-win for those who can afford to attend. 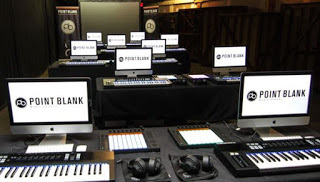 Regardless of the three locations, it is clear that Point Blank is a successful electronic music school that attracts globally successful DJ’s and producers as instructors and most likely is helping to create the next generation of electronic music producers. On an academic note, Point Blank School has a an affiliation with Middlesex University, which validates their Higher Education classes and those who complete the Point Blank set of courses receive a certificate and award upon completion. Middlesex apparently also “validates” the BA Music Production & Sound Engineering program. To sum it up, both Full Sail and Point Blank provide top-notch media production education. The location in which you live may determine your preference. Clearly, if you are in the United States, then Full Sail is more accessible and if you are in Europe then Point Blank is the closer option. Full Sail has a longer history and a vastly larger set of course offerings. They have managed to achieve accreditation as a “four year” university that bestows actual BA’s that in theory will transfer to other schools. The programs are steeped in a wide array of disciplines and many of their students move into the media industry with great success. For the youngster graduating high school in the US, or those willing to trek across the pond and can afford it, Full Sail is a valid, excellent alternative to the traditional liberal arts education and provides not only electronic sound and music production, but video arts and other media productions fields as well. They also have, which has not been mentioned yet in this article, a massive film set/lot where Hollywood sized films can be created. They command one singular massive campus with a four year college degree experience.In comparison and contrast, Point Blank is equally passionate and active in their own realm. Their realm is more singular however, catering to the world of elite DJ-ing and production and focusing on electronic music production and performance only. Clearly, the school has succeeded in attracting excellent talent to instruct and built campuses in three of the most illustrious places in the world (London, Los Angeles, Ibiza) to be an electronic music artist. Clearly their combination of talented instructors, course layout, and very importantly the exposure for current students to the club scenes of their various locations, are all major pluses. It depends on what one’s goals are as an aspiring sound/media artist and the degree you would like to have upon your graduation. Full Sail will give you legitimate academic credentials, serious professional contacts, a community, and support. On the other hand, Point Blank will give you expert skills for rocking dance floor, a certificate and perhaps a BA. Mostly, though, it seems it will give you high level contacts and experience in the world of globally recognized DJ’s. Both schools rock. Hats off.